You will find me here at Imbali Craft Centre from July to November each year, during the winter months when there is no work for fruit packers. Aunty Eva involved me in this group of women. 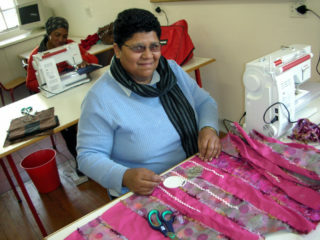 At first we just got together to teach each other the skills we knew, and later when Jeanne Bloch came to help us we established Imbali Craft Centre, and found these workrooms on the school premises. With all the knowledge I have gained, I can now make orders and sell these in the community: bed quilts, bags and beadwork. In this way I find it very satisfying to apply what I have learned in my own life’s journey. It is also my wish to be able to sustain myself only on my craft work: I believe I will be able to make a success of this if I put my mind to it. In the meantime I so appreciate the opportunity for learning together and teaching others, that my friends and I have here at Imbali.